FLIGHT TO JUNEAU: As a guest, you are responsible for arranging your own flights to the airport in Juneau, Alaska. Once you have arrived in Juneau, the Doc Warner’s team takes care of the rest. Guests meet members of the Doc Warner’s team at the airport on Sunday and then guests take a brief ride to the port to board the catamaran (or float plane). 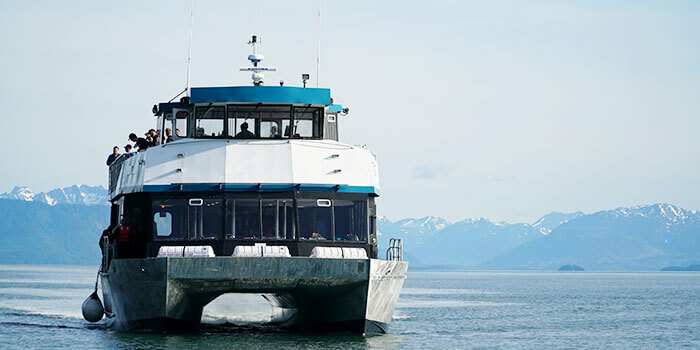 CATAMARAN: The catamaran ride is a comfortable journey through a small portion of the Inside Passage, between the islands and around the mountains that make Southeast Alaska such a pictorial paradise. The catamaran ride is approximately two hours and is the last leg of the journey. When guests arrive at the lodge, there is a warm dinner awaiting. AIRPLANES: When the airplanes are used, the journey is usually less than 30 minutes. If the weather is sunny, it is a swift and exciting journey over the Chilkat Range and a rapid descent to the waters in front of the lodge.